punched into the side of the bag I had used while entering the US. I don't think this was a random accident - someone bothered to open the bag (I was using a TSA "lock") and taped the three holes from inside the bag using some masking tape. This was a new bag, and I'm positive that the holes weren't there when I bought it. Has anyone heard of such a thing happening? Why would the TSA/CBP/other agency drill holes into the bag, when they could've simply opened it? (They could clearly open it since they taped the holes from the inside.) Could they've been inspecting the lining or something? UPDATE: @Harper mentioned a possible scenario of the logo of the bag getting broken by the baggage handlers. Yes, there was indeed a logo there, and now it's missing. So I guess this is not CBP/TSA's handiwork after all. The three holes are perfectly spaced, and too clean/consistent on both sides to be a rush job with a handheld drill. The dimples on the bottom suggest to me they were punched on a specially made jig. 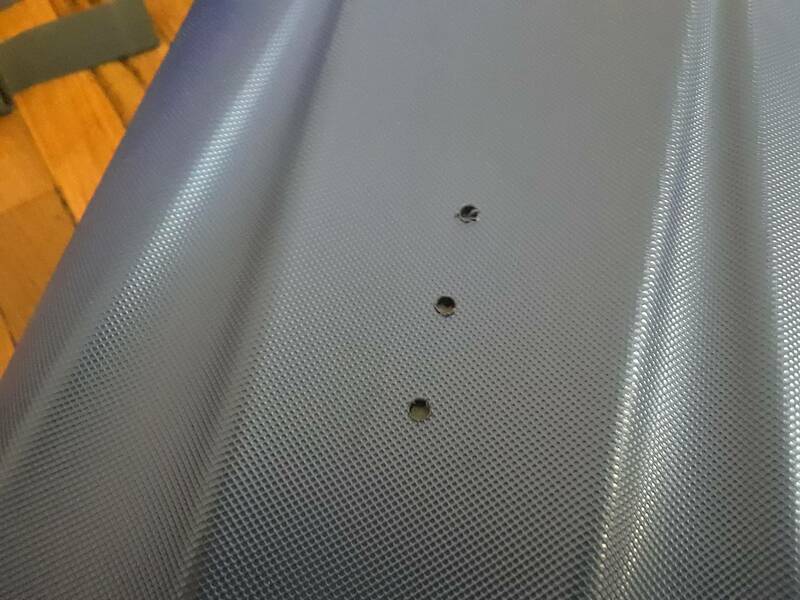 Look close at the photo and you can see the vestiges of a rectangle around all three holes, making about a 2-hole-width margin around the holes. The rectangle is either a discoloration or a dimpling on the surface. Very subtle. My guess is, a handle, fitting, logo, bumper, etc. went there. TSA or baggage handlers broke it off by accident, and asked TSA to try to fix it (since they could get inside the luggage to reach the screws). Or alternately, TSA was looking for concealed contraband, chose to disassemble the piece that goes there, and either didn't care, lost the screws, or didn't want to take the time to reassemble it due to workload. Perhaps the part+screws is in a ziploc bag tucked into a pocket you didn't check. Why would the TSA/CBP/other agency drill holes into the bag, when they could've simply opened it? Holes are normally drilled when a suspicious trace shows up from another test - for example, there may have been an anomaly on the x-ray, or a sniffer dog may have given an indication. 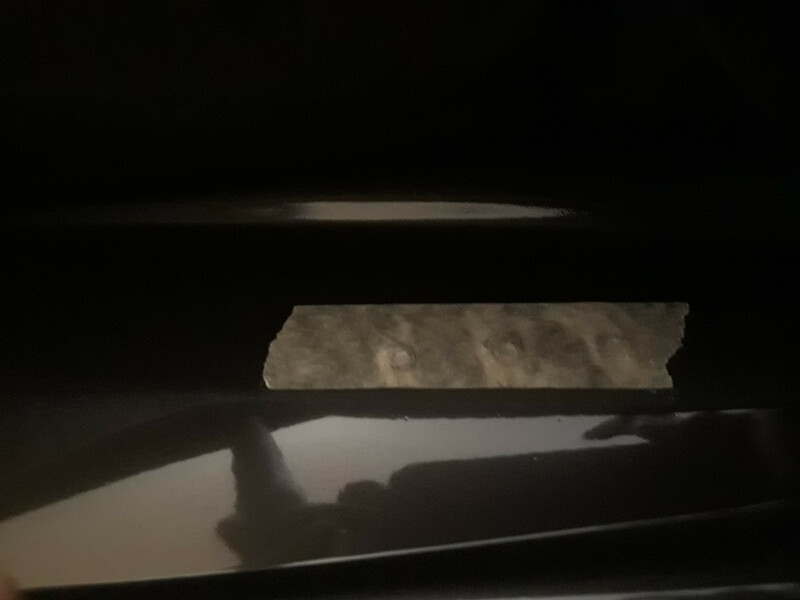 Smugglers are extremely adept these days at concealments - customs officials have seen such things as fake luggage cases where the outer rigid cases are thicker than they are supposed to be, where the smuggler has sandwiched an illicit substance between two thin layers of rigid plastic. If you watch various Customs and Border Control TV shows, you will often find cases where officials have conducted a search via drilling into an object - its often quicker and leaves less damage than any attempt to disassemble the item. In your case, they don't seem to have found anything. I am surprised that this was not done in your presence or a note wasn't left in your luggage as a result. The US Customs and Border Protection considers claims for damage caused by them in the process of them carrying out their duty. USCBP is known to drill into luggage in order to check for explosive material or illicit substances. A few years ago there was a minor uproar over customs officials drilling into a West Indian cricketer's bat when his team was touring in the US. This is not done trivially; usually, suspicion is raised because of some other test, or because X-rays or other tools cannot penetrate the area of interest. You can file a damage claim, although I cannot speak to the success rate for collecting any compensation. Not the answer you're looking for? Browse other questions tagged customs-and-immigration tsa privacy or ask your own question. Why do I need to buy a ticket to get into the secure half of a US airport? Do you go through customs when returning to your country if you never entered any others (by sea)? Do staple holes in front cover of the passport mean it's damaged?